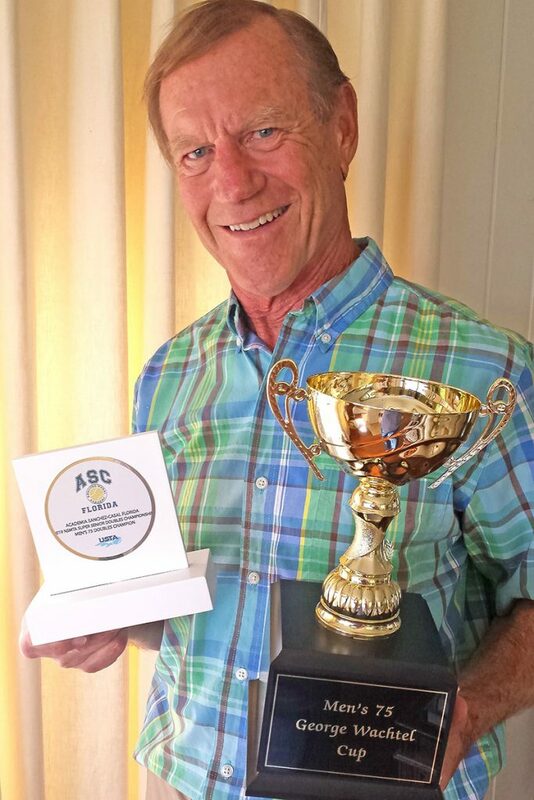 Chiropractor wins Men’s 75 Doubles tennis championship - The Resident Community News Group, Inc. | The Resident Community News Group, Inc.
Chip Travis and a partner took the trophy in National Senior Men’s Tennis Association beating12 other teams to take top-ranking award. Chiropractor Robert (Chip) Travis and his tennis partner, Jim Parker, recently took the trophy for the 2019 Men’s 75 Doubles Champions, sponsored by the National Senior Men’s Tennis Association. The NSMTA Super Senior Doubles Championships were held Jan. 9-12 in Naples, Florida. Although Travis adheres to a strict regime – eating healthy, lifting weights and playing tennis five times a week – he said he only had a month to prepare for the tournament. “I worked with former tennis pro Bill Gatlin, went to the chiropractor, got massages and went to a hypnotherapist – a physical, mental and emotional workout,” he said. Travis and Parker, who are long time acquaintances as teammates and former tennis coaches at Rice University in Texas, have played doubles together only once before and had only one practice session before starting the tournament. Travis lost part of one leg in 1970 in a Navy jet crash when the plane he was piloting, an A3-D dual engine aircraft, broke a rudder during a single engine landing training session. Later he had knee replacement surgery on the other leg, but is not one to let the loss of a limb slow him down. In the finals, the duo played a third set that went to 6-6 in games, at which time a 7-point tiebreaker was played, which they won 7-0 to win the trophy – temporarily.